For everyone who's been following me, they know my style is anything but loose dresses. My body type is not suitable for a loose fitted A-line dress. 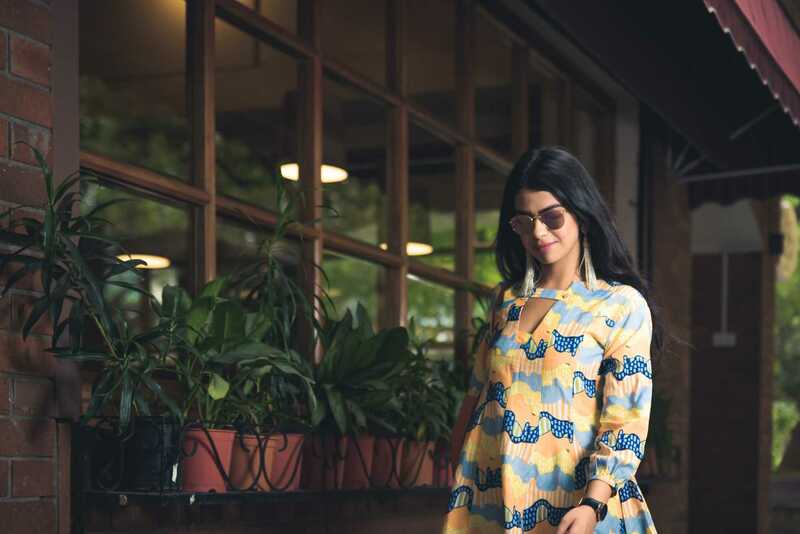 But this bright and quirky dress from https://thejodilife.com/ is everything. The play of colors in this dress make for the perfect combination. Hues of yellow, orange, and different shades of blue in abstract and handi crafted design make up for this dress. I have put together this look with neck-long tassel earrings and being block heels. The big sleeves and loose dresses form a major part of latest fashion for women these days. We are all going for ill-fitted clothes and clothes that let you breath in this weather. If you have a brunch to attend or have to go out for a day event, you can definitely pair this dress with a patent leather tan bag, a good pair of shades and beige block heels or gladiator sandals. If you have to continue wearing this dress for a dinner or a night out, you could replace the tan bag with a fancy clutch and the block heels with pointed toe heels and you are good to go. However, if comfort is your style, prefer wearing white sneakers with this. But make sure, you also tend to match the earrings style to the sneakers. We've got some easy fresh ideas for outfits you can wear to a brunch. Read more about my style and choices here.